Christmas Gift 1 is a homemade gift by courtesy of Terry Rodman. 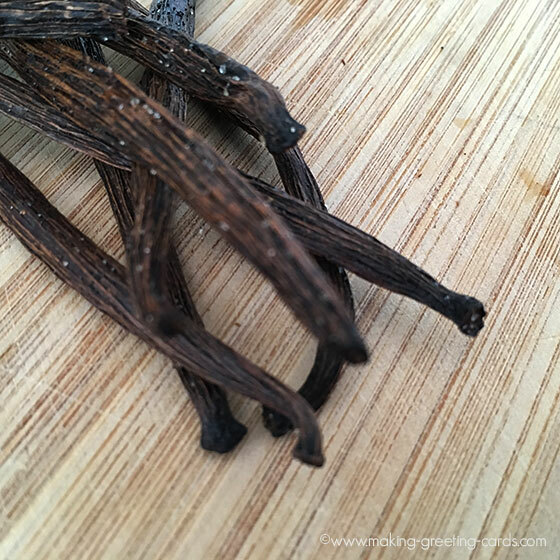 The hardest part of this homemade vanilla extract recipe is finding bulk whole vanilla beans. This is not a cheap recipe but it does make lots of christmas gifts. Remember an ounce of Vanilla is quite a bit. I use 1 or 2 oz bottles with corks. The bottle may be nice enough to just simply tie a ribbon around and a small note. Personalise your christmas gift with your signature. I take lots of pride in writing "Grandma Terry's Homemade Vanilla". For my girlfriends, I put "Homemade Especially For You by Terry". There are only 2 ingredients for this Christmas gift 1 but it's going to fill your home with a lovely fragrance this Christmas season. 1/4 LB whole Vanilla beans. Lay your bean on a cutting board. Take a sharp knife and cut the bean right down the middle so that you have two sides. You will see the black beans when you do this. Don't waste any. Scoop them off the knife or board and drop them into the bottle of Vodka. Scrap the bean with your knife gently and add that to the bottle. Finally, drop the whole bean into the bottle of vodka. Do the rest of the beans the same way. When done put the cap back on the vodka and shake the bottle real hard to mix the beans and allow the beans to float on the vodka. Place this bottle in your pantry or a cool dark place. Everyday give it a vigorous shake and then put it back into the pantry. You can use it within a month. However ... the longer you store it and shake it the better it gets! I have some that are 2 years old. It will not spoil. It will get very dark which is a good thing. When you are ready, gently funnel into small bottles. I have done this so often, I pour straight into the bottles. This way it has a chance to get even stronger. It is almost too easy to make and everyone will just wonder how you did that... It will be lots of fun. Thank you, Terry for providing us this lovely vanilla bean extract recipe. May our kitchens smell of vanilla fragrance every Christmas season as we prepare this lovely homemade Christmas gift for friends and family.